SIMPLIS transient analysis is similar to SIMetrix transient analysis. Number of Plot Points The total number of points to be generated. These will be evenly spaced within the start and stop times. SIMPLIS has the ability to save its internal state in order to allow a run to be repeated from a certain time point. This allows a run to be continued from where it previously left off. (Similar to SIMetrix transient restart facility). The internal saved states are known as snapshots. SIMPLIS always saves a snapshot at the end of every run so if you start a new run of the same circuit with a start time (Start saving data at t= ) equal to the stop time of the previous run, SIMPLIS will not need to rerun the start and instead will load the snapshot state. SIMPLIS will do this automatically. The entries in this dialog section allow you to specify the saving of snapshots at other times as well as the end of a run. This might be useful if you wanted to restart a run at some before the end of the previous run. 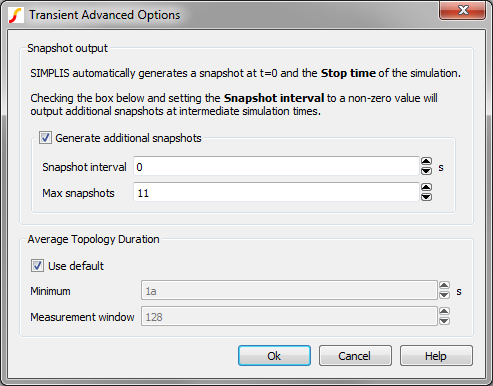 Snapshot interval This is the minimum duration between snapshots. Max snapshots This is the maximum number of snapshots that will be saved. This setting overrides Snapshot interval if there is a conflict. The purpose of this is to resolve problems with the simulation apparently getting 'stuck' in situations where there are unexpected very high speed oscillations. If this happens you may wish to increase the minimum time or reduce the measurement window as appropriate.